NEW TO THE MARKET!! 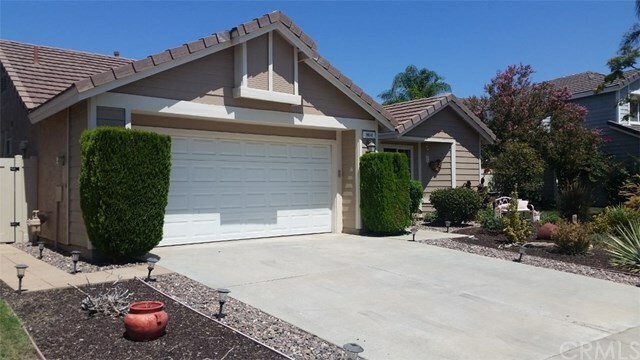 Lovely SINGLE STORY home on a quiet street in Menifee Lakes!! Two spacious bedrooms, two bathrooms, with an open floor plan, updated flooring and newer air conditioning. SLAB GRANITE COUNTER TOPS in the kitchen. TOUGH COAT EXTERIOR PAINT, plus newer A/C make this home very easy and inexpensive to cool. NEWER VINYL FENCING. Desert landscaping. Covered Patio in the backyard. Located in the Willows neighborhood of Menifee Master Lakes Association, which features fishing, boating, beach club, pool, and many community parks. Three blocks away from a huge sports park; three blocks the other way and you're at the BEACH CLUB! What a great place to live!! PLEASE NOTE that the Title Records//Public Information on this property INCORRECTLY state that the home is 1030 square feet with 3 bedrooms. THE CORRECT INFORMATION, as provided in the floorplan from the last appraisal, is included in the photos. 1244 square feet with 2 larger bedrooms. Please click on the virtual tour buttons for multiple photos.